Philips Norelco Bodygroom Review : While there are innumerable beard trimmers and hair clippers doing the rounds in the market, there are very few body hair trimmers for men. This may be just because body hair trimming is not a very common phenomenon among men and those who do, make use of a razor. But a razor is not a very safe and convenient way of doing it and includes a lot of nicks and cuts and leaves you with skin irritation and reddening. 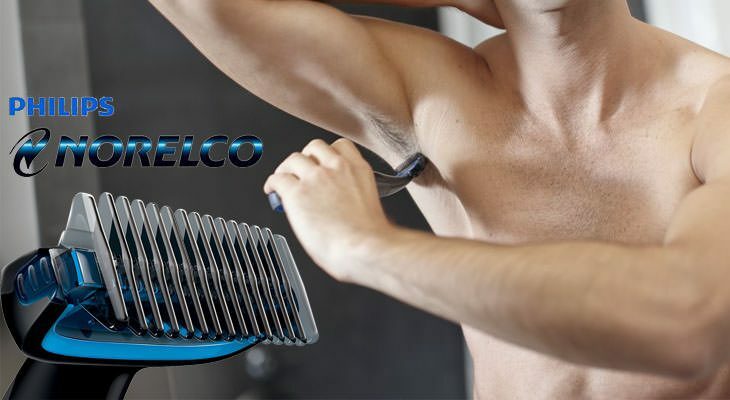 To avoid these, Philips in collaboration with Norelco, has come up with this sleek and affordable body hair trimmer for men. 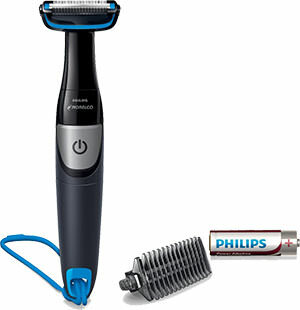 The Philips Norelco Body-groom 1100 Body Trimmer BG1026/60 is a cheap, cordless and super effective body hair trimmer specially designed to suit the needs of the metro-sexual man. It’s easy to use and even a first-timer can be pretty comfortable handling it. Having said all this, let’s have a look at what this body hair trimmer is all about and how it works. A look at this trimmer and the first word that comes to your mind is slender. This slender yet small and compact trimmer is specially designed for body hair removal and is your perfect travel companion. This cordless simple trimmer has a grey and black body and narrows down at the neck just before the trimmer head. This gives it the design perfectly suited to access the remote areas that may be difficult to reach with a robust one. 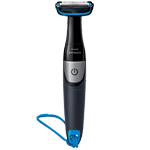 It has one single touch button gracing the centre of the trimmer handle and has close resemblance to a safety blade razor in terms of looks. The rear part of the handle has rubberized dots to provide an anti slip grip so that it can be used even inside a shower. The grip ensures that the trimmer doesn’t slip off your hands easily. It has a blue shower cord which can be attached to the bottom of the trimmer handle to hang it at a convenient place and is an important hassle-free storage feature. The trimmer head is equipped with two rows of bidirectional metal trimming blades in the middle. These blades are comb-like in structure and are encircled by a blue band on either side (left and right). On the outer sides of these blades is a row of black plastic comb that essentially guides the hair strands to the trimming blades for a precise snip. A part of the skin protector guards, these plastic comb rows help the trimmer blades to go as close as 0.5mm without the blades touching the skin surface and thereby protects the skin from occasional nicks and cuts. This trimmer is bi-directional and as a result it can be used in either direction. It gives you an uninterrupted smooth trim while you can glide your shaver in any direction. Thus you do not have to worry any more about the direction of hair growth. This bi-directional feature also helps in protecting the skin from skin irritation and rashes and avoids pulling and tugging. There is also an additional trimmer comb of 3mm, if you wish to keep the hair to a certain length and do not want to trim it so close. 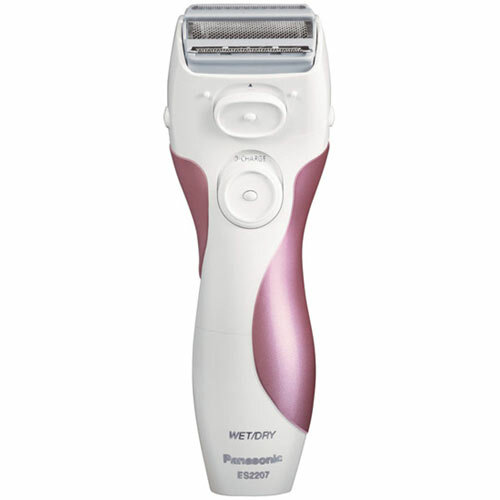 The Philips Norelco Body-groom 1100 Body Trimmer BG1026/60 can be used both wet and dry. It is 100% waterproof and you can use it in your shower if you prefer trimming under one. But Philips claims it to have an optimal performance in dry hair and so if you can avoid a wet one this is the best way to go. But if you can’t and prefer a wet trim over a dry then also it’s not a problem at all. The Philips Norelco Body-groom 1100 Body Trimmer BG1026/60 is powered by a AA battery. So, first of all it’s cordless and saves you the hassles of a corded one. Secondly you do not have to worry about charging it and the worldwide voltage compatibility of the charger. The AA battery that it uses is cheap and is readily available in the market anywhere around the world. You can always carry an extra battery for an emergency and so if the charge suddenly drains out in the midst of a trim, you can always replace the old battery with a new one within seconds and continue using the trimmer. A single AA battery can last you for almost two months. This makes it an ideal travel partner. 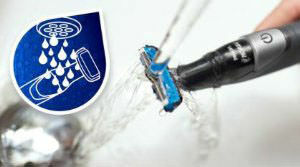 The Philips Norelco Body-groom 1100 Body Trimmer BG1026/60 can be easily cleaned by holding it under running tap water. It’s essential that you clean the trimmer every time you use it to maintain the hygiene as well as to increase the durability of the trimmer. You do not require any oil to keep the blades from clogging. Just the cleaning act works fine and hence it requires zero maintenance. With more and more men becoming accustomed to the art of grooming and people craving to look dappered, body hair trimming is also gaining immense popularity among men and it’s always better to start off with a cheap device that does its job well. And if you are already using one then this can be an additional option kept aside for your travels. And with the Philips Norelco Body-groom 1100 Body Trimmer BG1026/60 you can never complain.